In a large skillet, brown hamburger, sausage, onion and garlic over a medium heat. Season to taste with oregano, salt and pepper; drain excess fat. Place cream cheese in a microwaveable bowl and microwave on HIGH for about 45 seconds, until soft; whisk until creamy and smooth. Gradually whisk in the cream until smooth; stir in the Parmesan cheese. 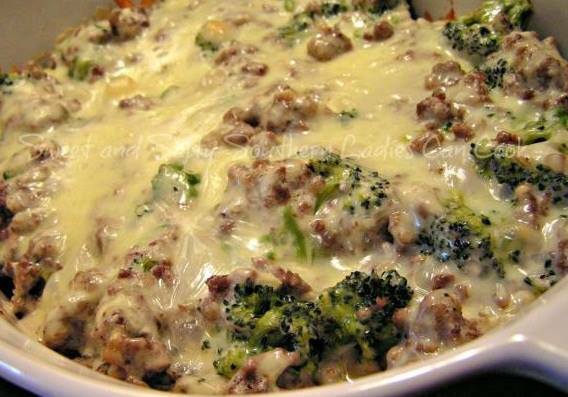 Combine hamburger, broccoli and cream sauce in a large greased casserole dish (2 ½ quart or larger). Taste test and add additional salt and pepper if desired. Top with shredded cheese.